A Warm Wind screens at the annual Thanksgiving Day Military Dinner at the Masonic Temple in Downtown Cheyenne. The Whistle Stop F.I.L.M. Festival makes a stop at the Cheyenne Community AIM Foundation Military Thanksgiving Dinner at the Masonic Temple in Downtown Cheyenne. We’re screening “A Warm Wind” in the 2nd floor continuously starting at 12noon. “A Warm Wind” made its premiere at the Cheyenne International Film Festival in 2011. 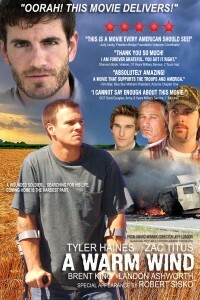 It is a moving story about an Iraq war veteran integrating back into his small Montana town. Buck, a Marine, has returned from the Iraq war. With physical disabilities, PTSD, and no real family to care for him, he can’t seem to fit into society. His cousin David puts his own life aside to care for him. Things get heated with family and friends who argue Buck is the government’s problem. David must do what is right. From imDb – With a lot of script changes, some re-casting, and a lot of Hollywood actors and crew not wanting anything to do with this subject, Jeff stood strong with his script and finally landed an amazing cast and crew. With research including Camp Pendleton, Walter Reed and San Antonio Medical Military Hospital, this powerful heartfelt story will leave viewers speechless at times. 92 minutes worth watching. A Warm Wind is completely different than any of Jeff’s previous movies. Sure it has some controversy, even some surprises you will not see coming, but what we hope you take way is the true meaning of the story. Jeff has taken two of the most talked about issues of the decade and brought them together, to show people that life is all about supporting each other, our family, our friends, our country.